Although fulfilling, life with children and pets usually requires compromise, especially when it comes to decorating. You may be dreaming of a stunning suede couch in creamy white, for example, and unless you’re going to cover it in plastic, that dream is probably on hold until after the kids leave for college. We can’t help you with the couch, but if you’ve been dreaming of gorgeous wood floors, you don’t have to compromise anymore. 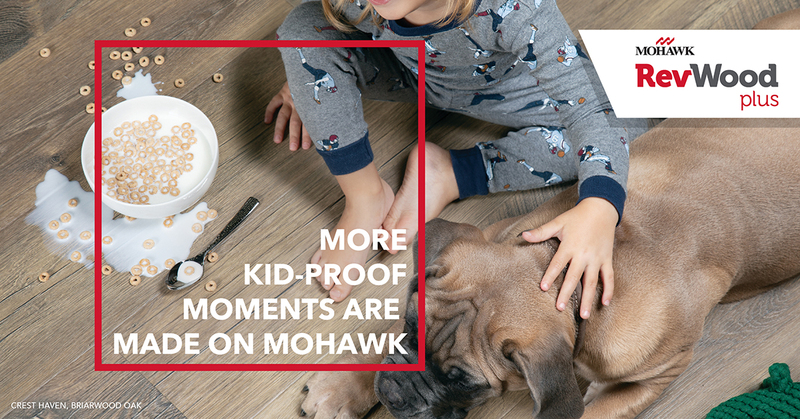 A revolutionary new product called RevWood Plus delivers the authentic look of beautiful solid hardwood in a flooring that actually stands up to the everyday messes and wear that only children and pets can manage. And it won’t break the bank. 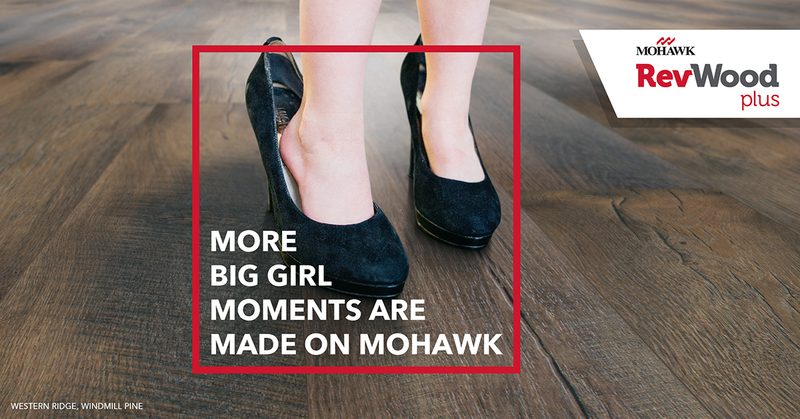 The most exciting innovation in RevWood Plus is its waterproof flooring system. Other wood flooring options allow liquid to seep between planks where it can damage the flooring and the subfloor beneath, but RevWood Plus traps spills on the surface, where they can be wiped away. And because it’s waterproof, you can install RevWood Plus in any room of the house, even mudrooms, kitchens and baths. Spilled cups of juice, dropped soup bowls, dripping bathing suits, muddy paws, Fido’s accidents—these are just a few of the countless daily mishaps that strike fear in the heart of homeowners with wood floors. But with RevWood Plus, the messes stay on the surface so they can be cleaned easily and thoroughly. Unlike traditional hardwood floors, RevWood is also tough. Its durable surface resists scuffs, scratches and dents. You can let your kids be kids and let your critters be critters without worrying that they will ruin the floors. And the surface is also stain resistant, so any messes can be cleaned up and forgotten. Of course all the performance in the world won’t make up for an unattractive floor. Many products try to emulate solid hardwood, but they usually fall short. They don’t quite look authentic, and they don’t feel or sound like solid wood underfoot. RevWood is made of wood, so it sounds and feels authentic. And the high-end design top layer gives you sophisticated wood visuals with ultra-realistic textures in a variety of fashion-forward colors and styles. If you want a wood look that speaks to refined classic style or to more modern sensibilities, or maybe even a reclaimed design full of character with knots and saw marks, RevWood has a style to suit your tastes. Choose from looks in cool grays, rich warm browns and just about every color in between. You’re sure to find just the right style to fit your aesthetic. It may seem like magic, but RevWood Plus combines three advanced technologies to achieve its revolutionary waterproof flooring system. Uniclic®, a patented locking system, snaps together tightly, creating constant tension between planks to keep liquids from seeping through. The perimeter of each RevWood Plus plank is coated with Hydroseal™, repelling water so the flooring resists swelling from moisture. And GenuEdge® allows the design layer and protective coating to wrap over the plank’s edges, which adds to the realism in addition to protecting the planks from moisture. Best of all, you can rest assured that your children and fur babies won’t be subjected to fumes since RevWood Plus is FloorScore certified with a minimal VOC footprint. With all the performance you need wrapped in the authentic wood looks you’ve longed for, RevWood Plus finally gives you wood without compromise.